The Gunclean Toftejorg i40 S is a second generation fully programmable single nozzle tank cleaning machine, designed for installations onboard chemical and product tankers as well as offshore applications. Gunclean Toftejorg i40 S is developed to meet the toughest tank cleaning requirements and features a hysteresis clutch with built-in speed adjustment. This innovative clutch construction is a substantial improvement over standard magnetic clutches, as it eliminates both slippage and the leakage risk of a speed adjustment shaft. In combination with optimized design and new, wear-resistant materials, it makes the Gunclean Toftejorg i40 S a simple and reliable choice for cost-effective operation. With a required deck opening of only 145 mm, the i40 S machine is the optimal machine for upgrading older cleaning tank machines on chemical tankers. The Gunclean Toftejorg i40 S is fully compliant with IMO regulations and the requirements of the classification societies. A flow of cleaning media is used to drive a turbine connected to the Gunclean Toftejorg i40 S gear unit. 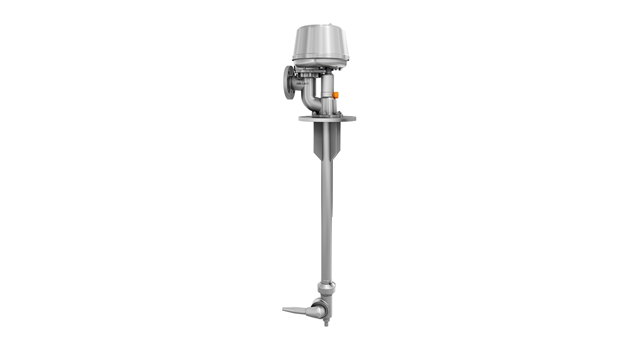 This drives the cleaning head horizontally while the nozzle moves vertically, directing the jet of the cleaning media in a helical pattern on the inside of the tank, for maximum coverage. Both pitch angle and rotation speed can be adjusted during operation, making it easy to adjust the cleaning cycle to match specific tank cleaning assignments. The use of a hysteresis clutch discards the need for the conventional configuration with a speed adjustment shaft at the turbine. This does away with shaft penetration, eliminating a key location for potential seal leakages and cross-contamination problems. The unique clutch used on this model comprises a number of strong magnets and a hysteresis plate. Unlike a standard magnetic clutch in which two opposing magnets must be synchronized, this type does not suffer from slippage, thus eliminating false starts. The clutch works as a soft starter, making sure that the tank cleaning machine always begins to operate as intended. The rotation speed of the nozzle is preset from our factory to a speed which is applicable for most cleaning operations. The rotation speed is easily changed by adjusting a magnet which serves as a brake.